You have got an idea, a business plan, or a product to launch and don’t have a website… But thinking to create a website? Put your mind at ease as this comprehensive guide will help you fit the last piece of the puzzle perfectly! We all know what a website is and how well a website can promote your business. But the only complication is that for many of us creating a website can be troublesome as we don’t have the complete knowledge to how to create a website, which platform to choose and what infrastructure to start with. Well, nothing to worry because we bring in a simple and easy-to-understand instructional guide on how to create a website right from the scratch without doing any coding. The list of resources and tools to build a beautiful and professional website along with the other important factors which you need to know about the website creation is what this complete guide has to offer. Here is an overview and table of content of what I am going to cover in this detailed tutorial. So, what are you waiting for? Scroll down to start with the steps on how to create a website for your business or personal use. Before we begin the process of choosing a domain name, let’s first understand what is a “Domain” and what is its importance. Domain Name is the address of your website by which users will access your website. Basically, Domain Name is the essence of your website! It gives the credibility to your business and tells your customers that you are here to serve them for a long period. In this tech-savvy world, merely starting a business is not enough you will have to promote it as well in order to attract a huge number of audience. It is certainly important to pick up a unique domain name as it will benefit your users to remember you. Selection of a domain name depends on the product/service or the purpose of the website creation. For instance, If you are an artist, and you wish to present yourself then you’ll consider having your domain name as “johntheartist.net”. But, if you’re running a business and wants to tell about your business then it requires great brainstorming to choose a correct domain name. It is essential to analyze every prospect before determining a domain name. Be double sure that your chosen domain name is not identical with any other existing domain name. Keep it unique, every way possible. It is another big factor which plays a vital role in choosing a right domain name for your business. Wondering why this “simplicity”? Because complex names create confusion and confusion can redirect your clients to some other site instead of yours. Yes, it is possible that your clients make a typographical error or may forget your domain name (if it is too difficult to remember) and can land on some other site with some similar name. Thus, it is advisable to choose easy to remember & easy to type yet unique domain name. Simple yet dynamic names stand out from your competitors. Never make a mistake of choosing the shortest path and include letters instead of a word such as “u” instead of “you” or “r” instead of “are”, “v” instead of “we” & so on. Such mistakes will only mislead your clients thus, hinder your traffic. Hyphens & numbers are strictly not recommended especially hyphens because they create a lot of confusion. For example, you have a website named “number1cakes.me” or numberonecakes.me” or number-onecakes.me” or “number-one-cakes.me”, all these names are prone to confusion and thus, distract your traffic. Your website is all about the product you offer, then why not your domain name? You got me right! Your domain name should speak for itself. Whatever business you’re running, your domain name should be relevant. Choose a creative and brand-oriented domain name to boost up your business. Your website is the core of your brand. So, when a client hears the name of your website, he should get an idea that what a website is all about for example “yogabenefits.us” it is clear from the name itself that this website is all about the benefits of yoga. Hence, you should always look for a domain name which is directly proportional to your business. If you are running your business in multiple countries, then it is advisable to have country-specific domains too because that can help you attract the local users. Keywords are the most prominent part of the SEO (Search Engine Optimization) as it will impact your ranking in the search results. Make sure the keywords are not stuffed unnecessarily to increase the ranking, it can backfire as well. Also, it is recommended to take the realistic approach to select your business-related domain name & keywords. As mentioned above SEO (Search Engine Optimization) optimized domain names are the most desirable ones. They help you attract more traffic to your website. People who are tech-savvy sometime go into details and look for EMD or PMD names. EMD is the name of the website similar to a word or phrase searched by the user. For example: If a user is searching for English grammar in Google or any other search engine and you are having a website “englishgrammar.net” then the chances of showing your website in the search results are higher. PMD is the name of the website which incorporates at least some matching words or phrases searched by the user. For example: If a user is searching for grammar in any of the search engines and you are having a website “grammarhelp.net” then chances of your website displaying in the search results increases rapidly. Note: Due to the frequent changes in the Google’s policies and algorithms the EMD & PMD have lost their significance in the SEO. There is nothing to worry about if you still find it difficult to single out an appropriate domain name according to your business or product. Just take a deep breath & relax! A domain name will be your online identity throughout (unless you don’t feel like changing it, yes, you can change your domain name whenever you want to). Domain name is the first and the most significant way to communicate with your users. Therefore, it has to be exclusive, clean, and dynamic. Carefully research each & every possible scenario before you finalize any domain name. The above-mentioned tools are freely accessible and can be a wonderful support you uncover your desired results. There are numerous domain registration providers available online which helps you register your website. The commonly used registration providers are GoDaddy, Bigrock, Domain, Name, Namecheap, 1and1, Google Domains, Network Solutions. Each of them has their own pros and cons, so you have to compare and check that befits you. After deciding a domain name check the availability for your decided name in the search bar of the respective registration provider. The possible results will be displayed at once & you can choose the one you like. No matter which site you are checking the availability of a domain name on, they all will use the same information. Thus, if your desired domain name is not available with one provider, then it will not be available with the other providers as well. Now that you are ready with the domain name, it’s time to choose a platform to build a website on. Choosing an appropriate website building platform is an integral part of website designing. First: You can use website builders which offers you a complete package of website building plus Hosting. Additionally, they offer to link already purchased domain, or directly buy a new one as well. However, you don’t have the direct access to the code of a website which restricts you to limited customizations and you have to work with the default arrangements only. Note: Hosting is a service that, while working with the domain name, allows your website to be accessible via world wide web, which is explained further in the post. Second: You can select a CMS (Content Management System), usually free of cost, and customize your website as per your requirements. However, you will have to buy a hosting service separately for your website. Third: You can create a website right from scratch doing all the Coding part all by yourself. Quite obvious only Coders will like this option. As doing the complex part is a matter of choice! So, these were the three options to choose from. Still not clear, don’t worry! What are we for, we’ll explain everything to you. Keep reading to find out more. Let’s start understanding all three in detail one-by-one, and explore the available platforms for each option. Here we go with the Website Builders first. cIf you are a complete beginner or someone in a hurry, then you should go for website builders. Wait Wait! Just in case you don’t know or forgot “What are website builders” here is a quick wrap up for you. Website builders are such exceptional tools which allow you to construct a website without getting into complex coding. It doesn’t take much time to create a professional looking website by using any of the website builders. They are easy to use and you can easily manage the entire content of the website. Currently, Wix is the most successful website building platform dominating the web design industry. Wix is a complete set-up that enables you to create a fully personalized high-quality website. It offers you around 500 templates to choose from. Wix has both free and premium plans. You don’t have to worry about the hosting. The flexibility to switch between the templates at any point of time makes Weebly more desirable. Hundreds of templates to choose from. Weebly also offers you hosting service. You can go through the plans by visiting the official website of Weebly. Another gem in the box is Squarespace. If you are an artist and want to create a website for yourself, then nothing can be a better option than Squarespace. It offers you an immense option to give you complete professional looking website along with the free hosting. There are few premium plans as well to upgrade the functionality. SiteBuilder is another very easy-to-use website builder. Just simply choose a design, customize your website and go live in minutes. It’s that simple! There are over 10,000 templates to choose from. Website Builder offers you a range of plans, starting from free to paid plans, choose as per your requirements. WordPress is one of the smartest and most desirable website building platform available in the market. The powerful interface and the amazing repository of resources make it even better. Over hundreds of themes available to choose from & make your own professional website. Web.com also offers you a bundle of feature to facilitate you to make your own website. Web.com gives you a free domain and hosting. Whereas you can still choose from the plans available. Shopify is the best choice to establish your online presence. If you are searching for a platform to run your business online, then Shopify is the choice to go with. Numerous themes available to choose from & give your business a shape of your choice. It also provides you the secure e-commerce hosting with unlimited bandwidth. So, these were a few examples of platforms to build website. Apart from these, there are many other website builders and platforms available in the market which offers you amazing plans on hosting and domain, with amazing website design features. However, you can create your own website using free and open source platforms often called as CMS. A good CMS will lead you to an excellent website and CMS selection totally depends upon your specifications. Before you start with your website you need to understand the chosen CMS first. Because a CMS can do anything required for your website. So, let’s get started. CMS stands for Content Management System. CMS is an open-source software that provides you a friendly platform to develop a website and manage the content. It authorizes you to edit the content and then publish it on the web. However, there are some CMS(s) which involve some coding & that would be a great pleasure for code lovers. That’s why it is crucial to choose a CMS as per your needs. Below are some factors to keep in mind while choosing a CMS. Select the best CMS Platform to build a website. Selecting the best CMS for your website can be really confusing & the most vital decision to make. As it will build a foundation on which our website will run. Selection of CMS depends on several factors such as coding requirements, budget, and technical proficiency. Thus, before we jump on the available CMS platforms, we would like to remind you few things which you should keep in mind before choosing any CMS platform. You need to identify how much coding does a CMS require and what level of coding you possess. Because the CMSes come in both forms: easy for beginners and advanced for pros. Choose wisely. Before selecting a CMS thoroughly research about the platform and be double sure that the platform is capable enough to provide you the level of customization you require as per your design and functionality needs. Furthermore, it is also important to check how extendable a CMS is. It is advisable to check if further customizations would be easy to achieve. Although, most of the CMS(s) are free to use & some are paid (not much expensive). You may need to spend some money on further customization. So, before you select any CMS, make sure it fits your budget. The responsibility of the platform provider does not end with the services it provides you. Rather it goes with your website’s life. You may need to reach them at any given time with your query. So, don’t forget to check the availability of customer support. There are plenty of CMS platforms available in the market. But, it is important to pick the best suitable one. Here are some popular ones to give you a clear idea of how they work & how you to make a website with them. WordPress is an open source CMS offering an amazing user interface that enables you to design your own website in no time. Also, you need not have the technical skills for it. It is a feature rich CMS which offers you numerous options to make a professional, responsive website with no hassle because no technical skills required. Joomla is the second most famous CMS after WordPress. Joomla is the best fit for both beginners and professionals. Numerous extensions are available to provide you the great experience and powerful website. Drupal is another powerful CMS which has a large number of followers. A huge number of modules available with Drupal enhances its functionality. Ready to use professional themes and amazing plugins will definitely a plus in website creation. You can easily create a well-versed website with Drupal or can hire a professional developer to do the needful for you. Unlike other CMSes that require you to install an extension for the e-commerce purpose, Magento is built to serve as an e-commerce platform, directly. All the basic features required to sell your product online comes in-built with Magento. Another masterpiece present in the array of e-commerce platforms. PrestaShop is an excellent e-commerce CMS to get your product(s) online. You’ve got hundreds of templates to choose from & produce a wonderful mobile responsive website. If you want to have an e-commerce website, then WooCommerce is also a great option to choose. It gives you a strong online presence & help in attracting customers. Woocommerce is most reliable and versatile e-commerce option available. So, it was all about the latest CMSes and the easiest ways to create your own professional and personal website. What about our code lovers? Well, we have everything for everyone in our store. Keep reading! It’s worth reading till the end. HTML (HyperText Markup Language) is the core of any website. It is the soul of any existing web page. In the more elaborate form, you can say within a document the ‘HyperText’ is a form of text that works as a link and the ‘Markup Language’ defines the layout information. You can easily create simple to complex web pages using HTML. For any developer, HTML is the primary language to master. Learning HTML is not that tough (of course it requires interest) but making creative web pages and a great working website is a skillful job to do. PHP (Hypertext Preprocessor) is currently the most dominating server-side scripting language. It is an open source language i.e. you are free to use it. PHP is simple to learn for the newbies and offers advanced features to the professional programmers. PHP supports all major operating systems including Microsoft Windows, Linux, Mac OS. You receive endless opportunities with PHP but first, you need to learn it carefully. Web Hosting is a service which allows a user to publish a website on the biggest platform called the Internet. A website is a sum up of web pages which further includes text, images, videos etc and when you want to show it to other people on the internet, you will have to buy a dedicated space for your website on a web server to make your own website visible to everyone on the internet. There are various web hosting service providers available in the market to provide you a reliable web hosting service. You can single out any web hosting provider according to your budget and requirements. A few of them are listed below. The plans that Bluehost offers are really affordable and are suitable for the newbies. It is a reliable host provider with no hidden charges. Your website will be available 24*7 without any downtime. Bluehost gives you WordPress integration with security options. You can try the 30 days free trial with money back guarantee. iPage offers you the simplest plans. iPage offers you an easy 30-days trial with complete money back guarantee. You will get 24*7 live chat support and 24*7 Uptime monitoring. You’ll get one-Click WordPress installation. Easy on the wallet hosting packages. A2 Hosting provider is the fastest hosting provider compared to others. A2 Hosting is packed with features to offer. Gives you great uptime and fast load time. WordPress integration. A2 Hosting also offers you a free 30 days trial and money back guarantee. GreenGeeks provides you a free domain with free nightly backups. They a range of hosting plans to offer to its customer. GreenGeeks gives you the facility to One-Click installation for WordPress. It also gives you a 30-days free trial with money back guarantee option. 24*7 customer support. HostPapa is a comprehensive web hosting provider. HostPapa offers you low pricing and quite a straightforward plan structure. Gives you a reliable and strong supportive environment. It gives a 30-days free trial with money back guarantee. Also, free site migration option. Dedicating hosting is like hire a complete server for yourself. There are no other sites on the server except yours. If you have a highly engaged website then dedicated hosting would be the right choice for you. Shared web hosting as the name implies, you would be sharing a web space with other websites. There will be few more websites on a single server like you. It is a great option if you own a small and not so heavily engaged website. Virtual Private Server is a type of web hosting where you do share a single server with a very few other websites but all of them get their own piece. Basically, a virtual private server is that where a web server is divided into small pieces and every piece is owned by some different website and that particular piece of server or space on server act as a complete virtual server to that website. Cloud hosting is more like using many servers together as one. It is also called as Grid hosting which can endure a huge traffic very easily. You will get as many resources as you want with the time. Managed WordPress web hosting is particularly for WordPress users only. It gives you amazing sorted things to use without any hustle. A dedicated team is there to run and maintain your WordPress website, 24×7. The above-mentioned types of web hosting and the selection of the type of web hosting is dependent on your budget, the bandwidth required, RAM etc. For instance, if you are up for a personal website, you can start with a shared hosting plan. If you are planning for a business website, you can pick Managed WordPress hosting or Dedicated Server Hosting. So, choose wisely! You have reached halfway through your website design process. You are ready with a domain name, a platform, and a hosting plan (if applicable), and now is the time you should start working on the chosen platform to design your website. The platform you have chosen in step 2 will determine the Setting Process. Since the builder works online so the setting-up process is different for them. Whereas, if you have selected a CMS or any other framework to go with, then you can work offline as well. To make it more clear, we have pinned down the possible scenario required for each of them. Let’s take a look. The process to set up a website is quite different in case of website builders/platforms as they entirely work online. For a better understanding let’s take a look at the setup process of Wix platform. Go to the official website of the respective builder and sign up for an account. It is quite easy to create an account just enter an email address and a password of your choice and click on sign up. It is as simple as creating an account on any other social media website like Facebook, Twitter, etc. Keep following the instructions and if you stuck somewhere then you take help from the customer support. Whereas, if you have selected any other platform such as SiteBuilder, Squarespace, WordPress.com, or Web.com, then also you are required to create an account on the chosen platform. The process is almost the same for each of them with some slight difference in the user interface. All the platforms have their own well explained step-by-step procedure to perform. Right from signing up to creating a website everything is neatly done. The help comes with the website builders makes the entire process of website creation easy and simple. So, this was about the website builders which you don’t have to install on your system. Whereas, if you choose to create a website with any of the available CMS(s) then the procedure is a bit different. Once you are done with the domain name and selection of a CMS to create a website, then clearly is the time to step forward and install your website on the server. Earlier, there were many things to take care of when installing your website on the server. But, with the advancement of the technology, options like “One-click installs” can do the hard work for you with their simple one-click feature. Another way is to setting up a website on your own system (locally) and publishing it later on. Let’s check out the steps for the above-mentioned ways to set up your CMS. First and foremost you need to create database. Now download the WordPress to your local machine. Once the downloading is complete extract the zip file to C:\xampp\htdocs\. A “wordpress” folder will be created under htdocs. After selecting the other important factors such as language and database. Now login to your dashboard and you are all set to go. For a detailed guide with images, you can refer to our article on How to Install XAMPP and WordPress locally. One-click install is a pre-assembled application provided by Hosting service which includes a required installation process having everything lined up in a proper format in order to install a CMS. Things like configuring the server settings, adjust file permissions, setting up a database, installing third-party applications and so on, is done by it in order to make a website run the way it supposed to. One-click install saves you a lot of time, you just sit back and let the hard work be done for you. Whereas, if your chosen CMS doesn’t offer you a “one-click installs” then probably it’s not the right choice to go with. The most interesting part of website creation starts now. The design phase of a website creation has such creative and engaging elements that will surely fascinate you. Designing a website is more of a creative job, how you want your website to look like and how it should work, everything depends on the selected theme of your website. Before you step into designing the layout for your website first, you need to design a logo for your business. A strong logo is the beginning of a strong brand. A logo should be an attractive and meaning amalgamation of text and graphics representing your brand & business. It is going to be your identity for the lifetime. It is a human tendency to fall for attractive things such as graphics rather than simple text. So, a logo should be brand-oriented and memorable. A great logo has the power to connect immediately. So, it is advisable to select your logo very carefully keeping your brand in mind. After the successful creation of your impressive logo now is the time to introduce your content and your product to your target audience. As we’ve discussed in Step 2 about the available website builders such as Wix, Weebly, Site Builder and so on, the customization becomes quite easier. 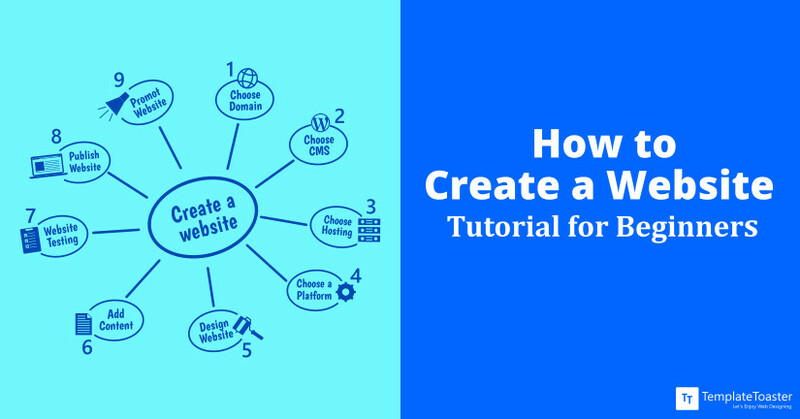 However, the following step-by-step web design process of Wix will give you an easy understanding. Choose the purpose of a website such as Business, Blog, Online store, Designer, Photography, Restaurant, Music, Event, Beauty & Wellness or some other. Then you will have to define the name of your business. An auto-generated message will appear with a start button. Once you click on the start button you will be asked to pick a style for you i.e. Fresh, Clean, Sophisticated, Horizon, Elegant, Skyscraper. After adding all the chosen array of elements & sections a great looking and professional website is ready for you. You can make changes in it later whenever you want to. Firstly, you need to choose a theme of your choice from the given options. Once you have selected a theme you can choose the edit option and get started with it. You can make changes in it as per your requirements. Everything you see in the theme is editable. From header to footer everything can be changed accordingly and those changes are viewable with a Preview option. After completion of all the editing hit the Publish button and share your website with the world. You can refer to below section on how to publish your website and take it live! But before publishing your website, you should consider testing the website and for your better understanding, you can refer to the below-discussed methods of testing. So, this was a step-by-step guide to help you with the website design, and almost every website builder offers you the same process. The choice is completely yours that which platform you choose to go with. Apart from these website builders, you can choose to show your own creativity with some DIY thing! What comes to your mind when you hear a word DIY? The answer is quite obvious “Creativity”. Right? Doing things all by yourself sets you free to use your own creativity by keeping some defined path aside. Use your imagination practice your ideas and explore new features to convert them into a real website. While in website design & customization DIY can be a positive thing to play with unless you are not using some predefined structure for your website. Working with CMS is like giving your desire a physical appearance with the help of tools that come along with CMS(s). In this section, we’ll be showing you the ways by which you can design a website with the help of available CMS(s). Theme builders provide you the theme options like Colors, Header, Footer, Sidebars etc. you can simply change the entire look of your website with different layout styles present in theme builders. Theme builders allow you to design your own theme having your own requirements within your chosen CMS. There are a number of Theme Builders available in the market. Some of them are listed below. Visual Composer is one of the best responsive page builder available. It has an easy drag-and-drop feature. It enables you to edit your content on the frontend i.e. on your live site and on the backend as well. Elementor page builder is an easy to use drag and drop page builder available. It is an open source page builder. You can directly edit and design and check the changes on the live page. Elementor page builder gives you an amazing working experience. Themler provides you the responsive web designs for various CMS(s) like WordPress, Magento, Joomla, Prestashop, Drupal. It also supports the e-commerce platforms like VirtueMart and WooCommerce. Themler claims to be the only web designer present in the market that support such variety of CMS(s) at once. TemplateToaster is a great website/theme builder software. It is really simple to edit your content with TemplateToaster at the frontend only. It has huge menu options to maintain your site. TemplateToaster is the only website builder that offers you the offline feature to make your work much easier. You can create themes and templates for almost every CMS such as WordPress, Joomla, Drupal, Magento, WooCommerce, Prestashop, VirtueMart, Blogger, & Opencart. A chosen website builder will help you create a website with your selected CMS. Below are the links to the detailed guides on how you can design a theme/template with TemplateToaster for chosen CMS. WordPress: WordPress is unquestionably the most popular CMS. TemplateToaster has advanced WordPress theme design options such as custom page theme design, custom widget area design etc. It is quite easy working with TemplateToaster because it doesn’t require any HTML or PHP coding knowledge. Here is a step by step guide to creating a WordPress theme from scratch. Joomla: Working with Joomla is simpler but not as simple as WordPress. However, TemplateToaster makes it easy working with Joomla. Programmers love Joomla because it offers tools and tutorials to explain its features and usage completely. Check out our detailed guide on how to design a professional Joomla Template. Drupal: Drupal is the most comprehensive CMS of all. TemplateToaster supports both 7 and 8 versions of Drupal and lets you create from simple to complex websites in no time. It authorizes you to create and manage your content effortlessly that too with the freedom to add and design a custom region anywhere in the theme. Blogger Template: Blogger template offers up simple to use interface. With TemplateToaster you can easily create a professional looking blog without much effort. It is a feature-rich tool to create perfect Blogger template from scratch. Divi builder has two main extensions first the front-end builder called as ‘Visual builder’ and second the routine ‘back-end builder’. The only difference between the two forms of builders is the interface. Rest everything is same. The back end builder works well with the WordPress dashboard along with the all other default WordPress settings. Whereas, the front end builder lets you build the pages on the front of your website only. Any changes made can be seen instantly. Well, these were a few of Theme Builders available for use. There are many more you will find on the internet and can choose as per your necessities. Ready to use themes are themes or templates designed by professional designers and developers that can be used directly on your website. These themes are loaded with functionality, logic and beautiful layout arrangement for a specific CMS. Using ready to use themes can save a lot of time and money. You can buy these themes or templates from theme marketplace like Themeforest, TemplateMonster, MOJO Themes etc. You can either go with a lifetime license for themes or purchase a subscription plan. Once you buy a theme, you are free to customize it according to your needs. These are highly scalable. Using these themes can give a fantastic look to your website. A Framework is the root of a theme. It contains the core code having the primary features and design components. A framework is used to facilitate the development of a theme. In other words, we can say that a framework act like a parent theme and a child theme (a new theme) will inherit the functionalities of the parent theme. Furthermore, it allows you to add or edit the functionality of the parent theme to produce the needed end theme. This can save you a lot of time and effort. So, this is the standard way how a framework works to build a wonderful theme. Here are some of the available frameworks for different CMSes. Genesis framework is quite popular WordPress framework which has a huge collection of high-end themes. It is flexible and a great choice for both a novice and a pro developer to customize existing themes. Also provides you the flexibility to create your own responsive website. Ultimatum theme builder provides you the freedom to control the layout and the design of the website without the need of coding. It is easy to use drag-and-drop framework. It has everything you need to create a theme using WordPress. Thesis is one of the popular WordPress frameworks. It is the best frameworks to give you a search engine optimized themes. The main focal points of Thesis are function and design. Thesis is the best fit for the more advanced level developers. Gantry is the free framework from the Rocket Theme professionals available for both Joomla and WordPress. Gantry is based on the responsive grid system. Gantry provides you the drag and drop flexibility to build a website page. These were some of the WordPress Frameworks and below are some frameworks for Joomla and Drupal. The term freelancer sounds so relaxing & removes the pressure from the mind almost instantly. Isn’t it? Well, it is not at all a bad idea to cut down the pressure of creating a website a bit by hiring a professional. There are many ways by which you can hire a freelancer to do the job for you. You just have to pay some fixed amount to that freelancer and in the specified time span (as discussed between you two) you can expect your website. It’s absolutely common these days to hire a freelancer to do the job for you in exchange for some money. Someone’s talent can benefit you. There are many resources from where you can quickly find a freelancer to perform the task for you. Some of them are listed below. Upwork was formerly known as oDesk. It is indeed the most well-known website for clients to find the freelancers to do the required work for them. You are required to create an account for both the cases. Whether you want to hire a freelancer or you want to get hired as a freelancer, you need to have your profile to start up on Upwork. You can find tons of techies here on Freelancer like SEO experts, blogger, translators, marketers & so on. You need to have your account in order to get your work done & for secure payments. Guru has over 3+ million members worldwide. Hence it’s quite easy to find the best suited professional freelancer for your project. You are required to post your job so freelancers can approach you by submitting their response to your job assignment. Certainly, you need to create an account for this. No matter which source you choose, you are supposed to have an account for further proceedings. Unlike other freelancing sites Toptal will only show you the experienced ones. Toptal conducts its own screening test for freelancers. To obtain any job on Toptal the freelancers are required to pass the screening test. Whoever freelancer passes the test becomes eligible to apply for the projects. This platform has something unique to offer you. The job posting and the job acquiring criteria is bit different here. Here freelancers showcase the skills they acquire. Freelancers market their services to the companies and companies or clients then pick the one that fits their required criteria. If you are designing a website from scratch doing all the coding and programming all by yourself, then you must have a strong grip on the language and technology you want to have your website in. Designing a website can be delightful if you know the right roadmap which leads you to a successful website. As already discussed in step 2. HTML (Hypertext Markup Language) & PHP (Hypertext Preprocessor) are the most popular and widely used languages to create a website. We have discussed the two below. Have a look for better understanding. Designing a website with HTML is really simple (once you will learn the HTML). HTML is the core markup for all the web pages & is the essential part of the web. You can use a simple notepad file to start with. Let’s see the step involved in the creating a simple HTML page. Step 1: The first line in the HTML code includes DOCTYPE element as ‘html’. This shows that the latest version of the HTML is being used. Step 2: In next line, we will add the ‘Begin’ & ‘End’ tags for the HTML document. We need to specify the language also i.e. English (en). Step 3: We require to add ‘Header’ tag with the ‘Title’ tag & ‘Charset’ details. Step 4: Now comes the ‘BODY’ tag which encloses the original HTML code. Step 5: A blank HTML document is now ready. Let’s now add the content to be displayed. You need to add Heading tag <h1> & a Paragraph tag <p>. This represents the first level of heading & paragraph below it. You can save this basic HTML page to any folder of your choice. Check out this detailed procedure to create a simple HTML page. The following steps may help you to create a website with much clear understanding. Step 1: The first line in your PHP code includes DOCTYPE element as ‘html’ which indicates that the latest version of HTML is used. Step 2: Next line of the code includes the ‘Begin’ and ‘End’ tags for an HTML document. Step 3: Third line of the code will include the <body> tag in order to start the body of the code and ending the </body> tag. echo is for printing your statements on the web. So, this how the basic things work in PHP. After you are comfortable with this, feel free to check this starter guide on PHP, and this one for creating the first project in PHP. You can attract your audience with the wonderful visuals in your website for once but, a good content will make sure that a user keeps coming back to your website. High-quality content is the key to a successful website. This is your prime duty to deliver the right information about your product or your business to your user. Your content is there on the website for a reason & to generate revenue for you. Thus, it is essential to write unique and original content for a particular website. Search engines are smart enough to detect any copied content. If your content is copied then be ready for the consequences they can even ban your website. Generating quality & SEO-friendly content is very important in website designing. A website should be attractive and informative at the same time. A well-written & SEO-friendly content promise you the regular flow of traffic thus increase your responsibility to be loyal to your customers. There are many ways to create engaging content. A website content should be capable enough to deliver the correct message with conviction to the target audiences. Writing content for a website is a responsible job and one should keep all the measures in mind while writing. If you are good at writing, producing powerful taglines and competent to create keyword-rich content for your website then it is a good thing to write yourself. Though a good practice is to hire a professional copywriter to deliver professional content for your website. Because your content should be the exact answer of what your target audiences in looking for. Only then your website can rank higher in the Google ranking. Each page of your website can rank higher in Google search if it is informational and keyword-rich (Don’t do Keyword stuffing). So, before you complete any page do proper market research and generate authentic content. If you want to reach the audiences belongs to multiple regions or countries, then you have to have a multilingual website. You never know which part of the world you will get traffic from. So, you should be ready for everything by making your website multilingual. Say you want to target the American audience & for that you need to have your website in the English language. But, at the same time if you want to reach the French audience, then your website needs to be in the French language. It is not feasible to create multiple websites for multiple countries. So, it is advisable to create your own website in just one particular language (unless it is region oriented). Instead, you can choose the “Translation” option for your website and make it available in multiple languages. There are various tools available to translate your website into a multilingual website. There are also distinct tools available for every CMS to translate a website to multilingual website. Take a look at the plugins available for a WordPress website. Now that the website is ready to go live, you need to test the website before you make it available for everyone on the internet or even after it went live. No doubt that you must have had taken a careful step to create a website but, at times some bugs may remain there. In order to remove those bugs, you have to test your website first. Note: Error is called Bug in technical terminology. In technical terms, web testing is a practice to run a website with the intent to find bugs. It is a process to improve the quality and accuracy of the website. To check if the website is capable enough to deliver the expected results & needs or not. Also, to find out the reasons why and where the website fails to deliver the expected results. It is advisable to introduce testing as soon as possible. Bugs detected at the later stages of a website can be heavy on your pocket. Therefore, testing each and every corner of the website before and after launch is important. Website testing is an integral part of website development life cycle. The prime goal of testing is to detect an error (if any) for better working of a web application. In a testing phase, all the functions of the website being checked thoroughly for every possible scenario to detect if there’s any problem. Web testing is important in both the cases whether you are doing it before the launch of the website or you are doing it after the launch of your website. If your website is not live yet & you are performing testing, then you will get enough time to correct all the errors occurring. Whereas, if your site is live & you’re performing testing on your live site then you can see the changes live. Live testing can be risky at times. You may encounter some serious problem on a site which can take some time to resolve & that problem-solving time can deter your users to access your site. Apart from the main objective of web testing i.e. to detect bugs, it can also be used to check if any particular part of the website require any further improvement or not. Each aspect of the website such as compatibility with cross browsers, the functioning of the website, performance of the website & so on require a different type of testing or may be multiple testings. It completely depends on your website that which method you require to test your site for. The following hierarchy is a generalized form of testing which is applicable to almost every web application. The primary purpose to implement functionality testing is to monitor if all the functions on the website are working properly or not. Functions like all the link submission for switching from one page to another, the database connection to extract information, etc being tested in this phase to ensure their accurate functioning. If during the testing cycle any part of the site does not work properly or not in a manner which is supposed to be, then it is advisable to resolve that issue there & then only in order to make your site work effectively. Usability testing is more about testing the complete usability of a website. Every possible corner of the website is tested for its functionality as a legitimate user would do. With the help of a specific group of users, the usability of a website is tested. How the website is working and how well all the areas of the website are responding to the user queries is tested under this phase. Checking if the navigation from one page to the another is smooth or not. Make sure it is not tough for the users to use it. All the options on the website like searching on the website, stay on the current page, etc should be easily accessible to users. From absolutely basic to the major functionalities of the website, everything is tested under this testing phase. Compatibility test as the name indicates is performed to verify a website’s compatibility with other system requirements. a website should be compatibility with the browsers it will run on and should also be fully compatible with basic hardware requirements. It is advisable for a developer to run a compatibility test in order to find out how effectively the website will work with all the operating systems and how the well the pages of a website will render different browsers before he goes online & make his website available to all the users. The main purpose of performance testing is to figure out whether a website is efficient enough to take the load or not. Yes, the website is tested for scalability and responsiveness. For a website to be a success it is mandatory to be stable even in high load times, needs to be fast and scalable. A website is considered being successful if it is good at handling high-load whenever required, scalable and has an optimized execution speed. Performance test makes sure there’s no loophole in the load processing time or in the response time for a sent request. When a site is built & even after a website has gone live, it is required to test perform performance test for overload. A security breach is intolerable and to ensure the security of any website would be the main aspect to take care of. The main purpose of security test is to check for vulnerabilities. If you are owing a high-security data website, then you will require to keep it as safe as possible and to achieve such high-security level, a number of authentication mechanisms are tested during this phase. If the data on your website is not safe then what is the point of having a website? Test like CAPTCHA, security questions, etc are performed and tested on various parameters to ensure complete data security of a website. The acceptance test is carried out to test if a website is accepted by the user or not. To check if a website is up to the user’s expectations or not. During this test a website is tested for its browser compatibility as described by the user (if you are building any third party website), checking for every request to be answered in the exact pre-defined format and making sure that no request is left unanswered. A website should be bug-free. Step 8. Publish Your Website & Go Live! Finally, the moment has come when you will publish your website and will make an online appearance so people can find you. Publishing means putting your creative content on the internet. Let’s take a look at the possible scenario according to the chosen platform. If you are using any website builder, then all the required actions to publish a website will be done automatically, you will just have to hit the publish button. The smart internal publishing mechanism in website builders will do all the needed work instantly and you will be live in minutes. If you have setup your website online using One-click install method explained above in Step 4, then you can simply publish your website by following the simple publishing steps. If you have designed your website offline in a local environment such as XAMPP then the further procedure is as under. Import local Database on live site. Check out this detailed post on How to move WordPress site from localhost to server; also it explains methods to do the same using plugins. After completing your web page made in HTML when you want to make it live, you will have to upload your file (index.php) to the server. Note: It is mandatory to have a filename of your home page as “index.php” else your website’s address won’t work. FTP (File Transfer Protocol) is the most trusted and easiest way to upload the files to the web server and make your online presence. There are two ways to upload your file to the server via FTP or through a control panel. 2. Now login to Filezilla. There are 3 fields in the top navigation bar i.e. Host Name, User Name, & Password. Host Name: you can simply use ‘host’ as your domain name or the IP address of your hosting account which was sent to you via email. 3. After entering all your login details click on “Quickconnect” button in order to connect Filezilla with your hosting account. 4. At the right side under the Remote Site option, you will see a list of folders of your hosting account on the server. You have to select the folder on the server in which you want to upload your website. 5. Local Site section at the left side has the list of folders. Select the files you want to upload to the server. Select the desired files that you want to upload, Right Click on your files and click Upload. Now your website’s files are being uploaded to the server. At the bottom of the Filezilla FTP client, you can view the uploading process. Now your website has been successfully uploaded via FTP using Filezilla. You can open your website in the browser now. 3. Go to the directory you want to upload a file to and click on the Upload link at the top of the File Manager. Once you click, it’ll initiate an upload page in a new tab. 4. Now drag-n-drop your file into the window or you can choose the “Select File” option to browse your computer for the file you want to upload. 5. It will then upload the file. Once the upload will complete it will show a message saying “100 %”. Digital marketing is a must-have when it comes to the business growth. There are thousands of websites available on the internet waiting to give you a tough competition. Perhaps seeing your website ranked higher in the search result is now what you must be thinking of. You know for a fact that to make your own website rank you need to do a little more hard work. It is not as hard as it may sound to you because there are numerous advanced tools available to help you with this. Website’s speed is an integral part of its success and it should always be at high priority. If a website is loading quickly, then there are more chances to get better user engagement, higher Search engine ranking & so on. There are many ways of marketing to boost traffic to your website and increase user engagement. Some are paid methods and some are organic methods, it’s completely your choice that which method you choose. Some of the most popular ones are listed below. SEO is the most trusted and tried tool in digital marketing to generate traffic to your website. SEO helps you increase the organic search results. Search Engine Optimization is the process to optimize your website’s content in order to produce more organic traffic from the search engines like Google & Bing. This process generally includes the keywords that are related to the keywords which a user is searching for in the search engines. Social networking websites like Facebook, Twitter, Snapchat, Instagram etc can be a great source to boost traffic to your website. Yes! You read that right. SMM (Social Media Marketing) is the technique which enables you to make most of these available social media platforms. These social networking sites give you an immense exposure to know what’s trending amongst the users. Hence, you can plan your business strategy accordingly. You need to pay more attention to what your target audience is involved in and what sort of modifications and addition they want in the current scenario. You can also have a one-to-one conversation with selective users to get the clear picture. Use this wide runway of social media and let your business fly high. SEM is getting paid traffic to your website. It includes the process to buy advertisements on search engines like Google and Bing to encourage traffic to your website. Google AdWords is the most popular paid search platform. PPC (Pay-Per-Click) is a great example of SEM. PPC is a technique where your paid adverts are placed above the organic results. If any user clicks on your ad, then you will have to pay to the search engine. The charges totally depend on the keyword competition you have against the keyword your advertisement is getting clicks for. PPC is getting more popular during the recent time. Content marketing is the super innovative approach to digital marketing. The unique and engaging piece of content can bring users to your website. Also, creative, informative, & unique content can generate a strong relationship with users. You should create content according to your user’s interests and expectations. Never mislead your audiences with false information or plagiarised content. Content is dominating the digital marketing! No matter which strategy you choose, you need to have a compelling content to increase your traffic. For instance, you choose to go with Social Media Marketing, you will have to create a compelling content to interact with your target audience. Email marketing, Online marketing, Blogs, Videos everything & everywhere you require a quality content to promote your business and service. So, pay more attention to your content. Email marketing is another great way to target your audience via email. You need to gather your user’s email addresses by offering them a subscription. Once you have the data, you can use it for your business promotion. You can also offer your services to the users via email. Email is the more personal & powerful way to interact with your customers. There are various other strategies & numerous tools available which you can use for rapid growth in your traffic. Below is a list of the key tools required start with Marketing and SEO of your website. Google Analytics is the powerful tool to track the traffic on your website. It provides you the details about who visited your site, how they found your site, which web browser they are using, what keywords they using to get to your site & what they are searching for. You’ll get everything at one place. SEO (Search Engine Optimization) is the main ingredient in the success recipe of any website. SEO is like salt in the dish if it is added in correct quantity then it can make your dish delicious and if missing in your dish, then probably no one eats the dish at all. Talking in technical terms SEO is the practice to create your website search engine friendly so it can rank higher in the Google search. Yoast SEO has widely used SEO plugin for WordPress websites. Google offers you a free service called Search console which facilitates you to supervise your website’s behaviour in Google search results. There is no need to sign up in Google search console for accessing its features instead you can easily make use of it. Whereas, if you sign up then you can get information about how Googlebot crawl your data, how much search traffic you are getting, search phenomena, the overall performance of your website. Everything you would want to know about your site’s traffic generation mechanism can achieve by Google Search Console. Web performance is the basic requirement for any website to get ranked higher in the search results. It should be the topmost priority for any developer to make his site number one. Performance optimization is how quick your web pages load or download on the user’s browsers. Web performance optimization is carried out to check where a website is facing load or delay. Speed optimization is directly related to the speed of your web pages. In how much time does a page or media content loads. Once a user clicks on the page or media, how much time it takes to load the entire content on a user’s web browser. Speed is one of the major aspects of web development cycle and it should be taken seriously to make your site rank. Every single side of marketing is important and to make your own website is visible to everyone on the internet. Recap on How to Create a Website Step by Step ? First and foremost choose a Domain Name for your website. Test the website for any possible errors/bugs. Publish the website and go Live. Ready to Make Your Own Website ! In this digital oriented life, it can be challenging to make your online presence but we hope our efforts would help find a better way to overcome every challenge you come across. Your growth depends on your product and service but a magnificent website is a gateway to this growth. So, what are you waiting for? Go and get your revenue generating website today and let everyone feel your presence. If you really liked our post then we hope to hear from you in the comment section below. Your suggestions and references are welcome. Feel free to contact us for any help.